The other day I had one of those realizations that is inevitably followed by a deep yawn and a pop of the ears. Not too long ago, there was a piece of data produced that was so powerful, so undeniable, that anyone who saw it and took a moment to truly ponder its meaning was forever changed. While it arrived at a time of great change and to a certain extent, great liberation, it didn’t have the long-lasting effects that it should have. 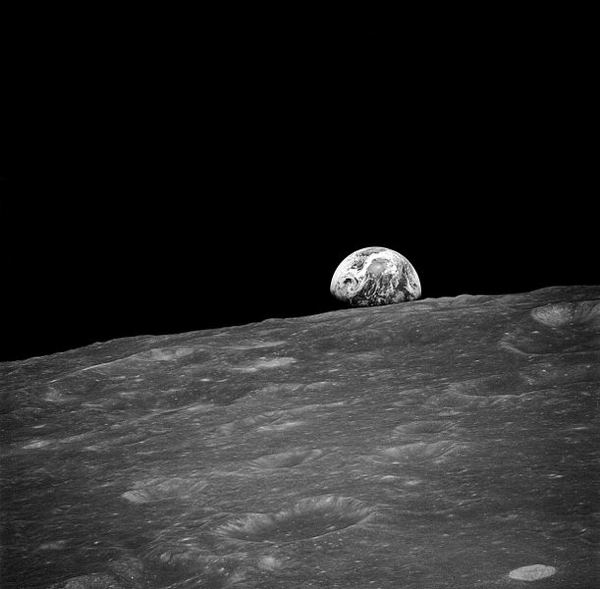 That piece of data was a photograph, popularly known as “Earthrise,” that was taken 43 years ago, on 24 December 1968, by the Apollo 8 astronauts, of the Earth from the Moon. To see our situation, seeing all that we have for what it is, a rock floating in the middle of a vast and almost entirely empty space, so small in the grand scheme of things, so frighteningly fragile—how could that not forever change who we are? We’ve been looking down at the Earth ever since, reproducing that same idea in higher resolution with greater detail. 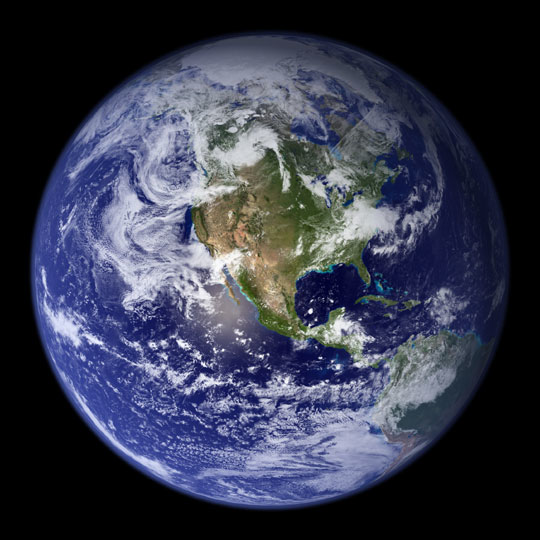 In 2002, NASA produced the most spectacular image yet, the famed “Blue Marble.” It is baffling to me that we can look at that picture, with an impossibly thin layer of gas that is all we have, and continue to behave the way we do. The information coming from space in 2011 has been the kind of incredible stuff that makes me grateful to be alive to see it. I can’t help but notice these incredible videos coming out of the International Space Station, like the one huge time-lapse of Earth from Michael König on Vimeo. Electric lights, fires, and lightning, all go whizzing past the camera. Thunderstorms, as experienced on Earth, are monumental occasions, inspiring an entire pantheon of gods for myriads cults and superstitions. Now they are so many tiny electric crackles, harmless and beautiful. The everyday bickering and ludicrous materialism of life on the surface seems so petty. When I was in elementary school, we were taught that there were no other “solar systems,” no other planets like Earth, that we were alone in the universe. It seems like yesterday the Drake Equation described impossible odds. Then we got better at looking at the sky and suddenly the heavens lit up. It seems pretty obvious now that we’re not alone. Quite the opposite. With what we now know about extremophiles, meteors, and the tenacity of life in general, it seems clear that life or its precursors are scattered around the galaxy like the seeds of a great tree. Every time the seed of life lands in a habitable zone, it sets off a timer as evolution races to reach a stable state before exhausting the available resources. Those that do get to move to the next level. Those that don’t…. There is a threshold and we are very close to not making it. There’s a non-zero chance the carbon dioxide we pumped into the air has set off a methane cycle that accelerates global warming, that we’re already too late, and that we might not have 100 years. We need to start thinking on a global scale about our place in the galaxy. Who cares what kind of sneakers you’re wearing? Why are we still killing each other? We cannot move to the next level until every person on the planet has the same opportunities, enjoys the same liberties, and controls their own destinies. As long as people live at the suffering and expense of others, as long as the system is geared toward turning us against each other, as long as we remain distracted by every glittering thing, we will remain stuck in one place while the timer keeps ticking. So much of what we are surrounded by is the people in control trying to distract us from reality in a vain attempt to delay the inevitable. Change is coming. The system is obsolete. Feelings of anger are misplaced. It’s not a question of good or bad, it’s simply a feature of the universe. We would all do well to refrain from pettiness, cruelty, and violence. History is watching. Life has its waves. There are ups and downs. My not insubstantial gut and my lucky stars both are telling me 2012 is going to be an upswell. Let us do as we do where I grew up and catch that wave. Put aside your fear and cynicism. The future is ours to create. The system is ours to debug and refactor. Here’s to a bold new year and a bold new age!